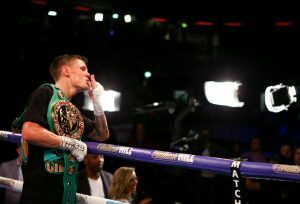 Defending his WBC flyweight title for the first time, Charlie Edwards improved his professional record to 15-1 (6KOs), with a completely dominant performance over Spanish challenger, Angel Moreno. Edwards’ light-handed jab and power shots were enough to demoralise his Spaniard opponent over twelve rounds. The Londoner was well aware of his responsibilities as a champion at flyweight tonight, and Edwards went twelve rounds in dominant fashion, but with Matchroom sending their best Brits abroad recently, if Charlie wants to headline a show again, it must be a unification showdown or a bout with super-fly champ, Yafai. If they weren’t on notice already, Britain’s best light-heavyweights are struggling to avoid Joshua Buatsi. In a Cruiserweight commonwealth and British unification, Lawrence Okolie took just four rounds to dispatch of Wadi Camacho. It was obvious from the start that Okolie, holder of the British strap, wanted to defy the critics that he’s too keen to clinch rather than engage. The undefeated fighter came out swinging and although his punching was sporadic, it forced Camacho onto the backfoot early. Southpaw, Wadi Camacho was struggling to land and reluctant to throw as ‘The Sauce’ hustled the commonwealth champion out of contention. Okolie buzzed Wadi on numerous occasions early on but indiscipline, seen in previous bouts, began to creep into Lawrence’s approach. ‘‘First and foremost, I don’t care who I fight. That’s never been who I am, or what I’m about. Making his first return to the ring since losing as a professional for the first time, Lewis Ritson, dressed in his now signature black & white shorts, defeated German Argentino Benitez, of Argentina, to a unanimous decision however the scorecards, that came back as 99-91, 98-92 (x2) all for the home fighter, did not do Benitez justice. The Newcastle-native went in for the kill immediately, only slowing down his punch output when it suited him. However that was in the first half of the fight; Benitez came back with a resurgence in the second half of the 10-round bout, setting up a nervy ending. Ritson, now 18-1 (11KOs) claims the WBA ‘Inter-Continental- lightweight title, but more importantly returns to winning ways after his surprise decision loss to Francesco Patera in October. Jason Quigley, fighting for the first time in Europe, made easy work of Mathias Eklund, 10-1-2 in just two rounds. Quigley of Ireland, who’s previous 15 bouts were in the US, improves to 16-0 (12KOs) and intends on fighting more frequently in the UK & Ireland.